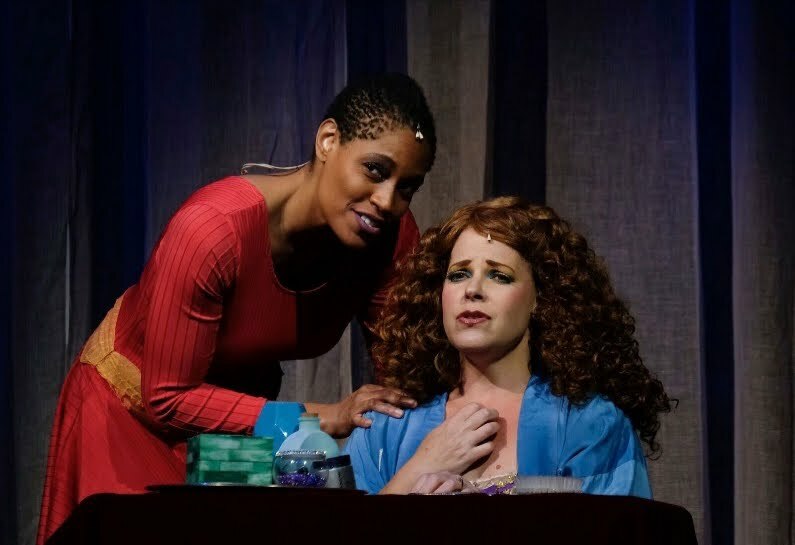 Carol's Theatre Reviews ~ It's Fun To Go Out: Daebroen Poiema soars as “Aida” in Season Opener at Moonlight. Daebroen Poiema soars as “Aida” in Season Opener at Moonlight. Moonlight Stage Productions kicked off its 37th summer with the Elton John (music)/Tim Rice (lyrics) and Linda Woolverton, David Henry Hwang and Robert Falls (book) pop musical “Aid- The Timeless Love Story”. It is based (loosely) on Giuseppe Verdi’s beautiful Grand Opera of the same name. Winner of four 2000 Tony Awards, “Aida -The Timeless Love Story” opened on Broadway in May of that year where it ran for 1,852 performances. It was performed here in 2007 by the now defunct Starlight and is finally making its way back north to enthusiastic crowds in Vista. 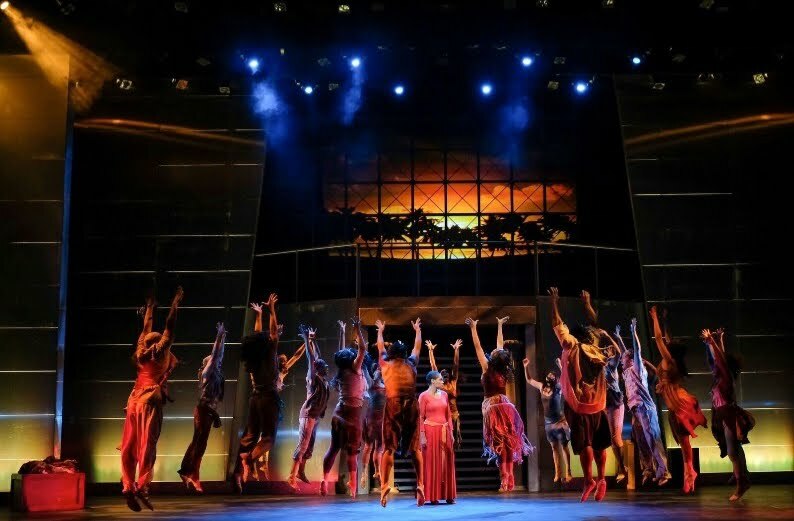 “Aida-The Timeless Love Story” follows Verdi’s opera without the high drama, beautiful arias and elegant pageantry (think the Triumphant March that lasts well…forever in my mind) that is so much a part of that stylish and magnificent grand piece. The musical opens with Amneris (“Every Story is a Love Story”) high above in ancient Egypt while below tourists are roaming through a contemporary art museum with statues of Egyptian gods. Two young people cross paths and one can only assume they are today’s star crossed lovers. It also closes the same way. With musical beats and rhythms taken from Reggae, Motown and Gospel, typical of The Elton John /Tim Rice collaboration almost all genres are captured. It is also one of the many pop musicals that parody other opera’s such as “Rent” and “Carmen” that premiered at the La Jolla Playhouse so many moons ago. “Aida” plays out in typical dramatic style. 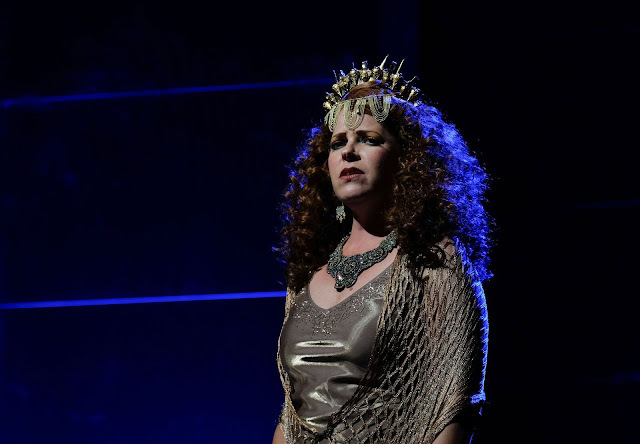 It is laced with morsels of humor, satire and (if you know the opera) predictability when Amneris learns of RAdames' love for Aida and his refusal to marry her. 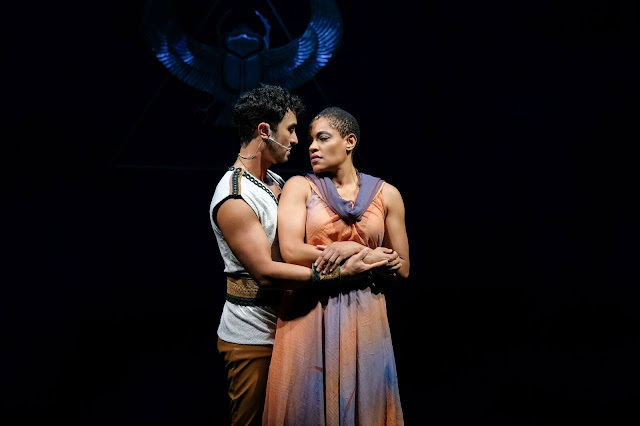 Even as his father, Zoser (Bill Ledesma) claims responsibility for Pharaoh’s sudden illness and a rush to a hastily arranged wedding Radames is an unwilling conspirator in his father's plot. Under director and choreographer John Vaughn’s capable direction, and musical director/conductor Lyndon Peguda, Aida hums along with a competent cast of no less than 26 young and vigorous ensemble members and excellent performances by the leads. Last season’s “Sister Act” starred Ms. Poiema and she’s no less amazing, no exquisite, in “Aida”. The music is not easy to navigate. It soars from highs to lows and each 'aria' has its its own set of obstacles. Singing opposite her as the celebrated hero, Bermudez is no one to take a back seat. Both score high in the navigating through John’s musical score. Bets Malone, a Moonlight favorite and regular throughout the ages traverses many incarnations of her character going from self indulged fashion queen to next in line to become Queen of a People with humor and agility. Her voice, still powerful enough to belt out “Every Story is a Love Story”, she did struggle in the higher registers sounding too loud and somewhat shrill. 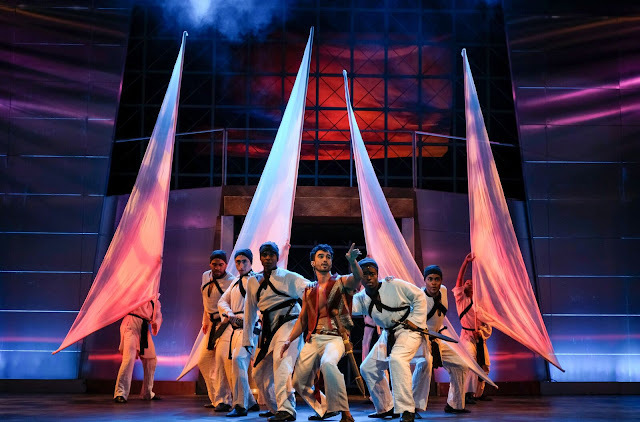 As usual Moonlight has always attracted great dancers and for this production choreographer Vaughn and his ensemble continue their high standards whether in “Dance of the Robe”, “Like Father Like Son”. Bill Ledsema’s Zoser, Terrance Spencer’s Mereb lend support and Gabriell Jackson’s Nehebka stand out as part of the slave brigade. Costumes and sets provided by Music Theatre of Wichita and coordinated by Carlotta Malone, Roslyn Lehman and Renetta Lloyd are a combination of contemporary and, what we’ve come to believe as typical rags worn by the slaves. Credit to lighting designer Jean-Yves Tessier, Jim Zadai, sound, Gabe Nunez, makeup and Peter Herman, wigs. Coming up next in the season is Disney’s “The Little Mermaid”. No doubt all the little mermaids will be there in full fashion. Dress warm it does get chilly after 9.